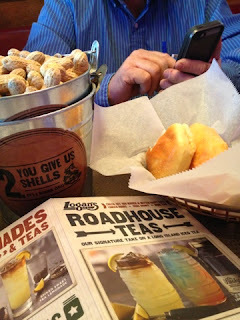 During our short stay in Amarillo we had a late lunch/early dinner and I suggested we try Logan's Road House. It is the kind of place where they encourage you to drop your used peanut shells on the floor. I am kind of OCD about things being just so and this just didn't sit right with me. I felt so guilty dropping them on the ground, I felt bad for the person who had to clean it all up. My meal was a mish mash of a few things with included Grilled Tilapia with a zesty corn and black bean salad then topped with crispy tortilla strips. 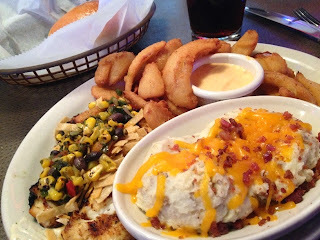 I was offered two sides and I chose the Loaded Mash Potatoes and Onion Peels. The potatoes were just fine, my one complaint was I wish they were served at a much hotter temperature. When they got cold the cheese kind of congealed and made eating less desirable. The Onion Peels were fantastic as was the spicy horseradish dressing. Another day on the road and another new restaurant. Melissa Good Taste just loves her life on the road! Lots of miles means lots of new eats! !